Sixteen Low and No Sugar Recipes from Southern Plate! Please leave a comment below and let us know if you’ve tried any of these – or just how your day is going! I just love hearing from y’all! 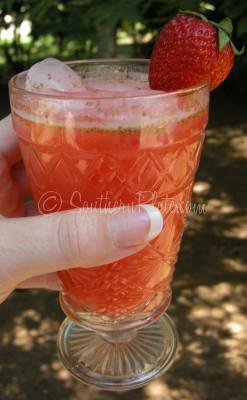 Today I thought I’d bring you another compilation post of low or no sugar recipes that are on Southern Plate. I put one of these up last year but I’ve had so many more recipes to add to it that I just did a complete update and ended up with 16 of my favorite recipes for those of us who, for whatever reason, need less sugar in our diets. Be sure to read the notes by each recipe here before going to the post to make sure you know how I modify the recipe as sometimes it may not be as prominent in the post itself. Of course there is natural sugar in milk and of course there is natural sugar in fruit, no sense in splitting hairs. I just wanted to show you what I do to make desserts and treats more friendly for myself. See, sugar and I are not friends. Sugar doesn’t like me very much and I can only have it in ve ry small quantities at a time. Now do y’all think for one minute that I am about to go without all of the sweet things I post on Southern Plate? Yeah, you know me better than that! I have “workarounds” for several of our classic Southern dishes and you’d never know the difference! So lets start things off by letting you know what I do differently to the following dishes in order to make them feast friendly for those of us who are watching our sugar and calories. I’m afraid I can’t give you nutritional values. I can’t tell you how many calories per serving or how many grams of sugar, fat, or protein each dish offers. It would be nice if I had that ability but I don’t own any fancy shmancy software to allow me to do that (and I detest math enough not to even attempt to calculate it on my own) so I’m afraid you’re on your own there. A note about Splenda: In most of these recipes, all I do differently is substitute Splenda for sugar. I don’t use name brand Splenda. I buy a generic version of it in the big yellow bag (At Wal Mart it is called “Altern” but Kroger has generic as well, as I’m sure many other large retailers do). A bag sells for about six dollars and lasts me a pretty good while. My best advice when substituting Splenda for sugar is to use a hair less Splenda than the sugar it calls for. For example: If a recipe calls for one cup of sugar, measure out a cup of Splenda (don’t pack it!) and remove a tablespoon. The common mistake most people make when substituting Splenda for sugar is to add a little more than what the recipe calls for. This yields an artificially sweetened taste. So use a little less and you’ll be just fine 🙂 . Unfortunately, you can’t substitute Splenda for sugar in baking and have the end result turn out the same. You’ll notice, then, that none of my Splenda recipes include baked goods. Now, how about some Southern Classics without the guilt? This one qualifies at “lower sugar”. Rather than a traditional cream filling, I make mine out of light whipped topping and sugar free pudding. You can also use skim milk. The only “real” sugar in these is the bit of glaze on the top. Might not be a no sugar recipe but its definitely a lot lower than something from a doughnut shop! The first time my mother had this she said it was so good she almost spit it out, knowing it had to be loaded with sugar. Guess what? It’s sugar free! Easy Peasy, classic hot chocolate, just use Splenda instead of sugar. We make this with Splenda and sugar free fruit cocktail. There is a good bit of natural sugars in the fruit but its a much better alternative than if you had a full sugar version. Yes, the cake has sugar. But the pudding icing on top leaves you much better off than if you would have used traditional icing. 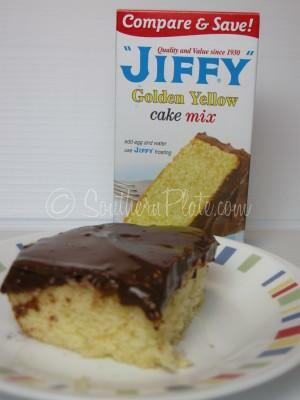 This is also one of my FAVORITE cakes from my childhood. I like to keep it in the fridge and eat it cold. YUMM! I like to keep these in the freezer in the summertime. They are a great treat for the kids and I eat the plain ones or the ones with nuts so I can join in on treat time! 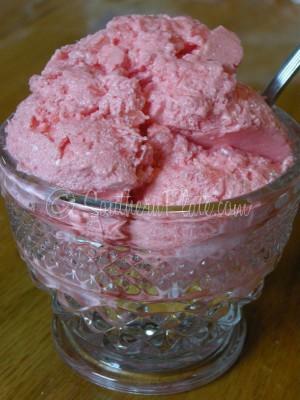 We use sugar free whipped topping and sugar free gelatin in this one. You can make it any flavor you want by changing the gelatin! WHAT? You’ve been doing without CHOCOLATE GRAVY? 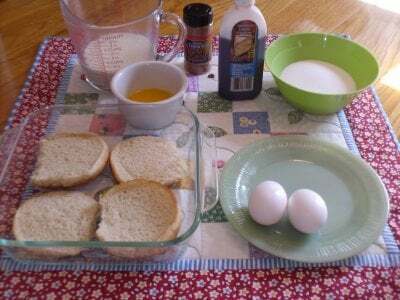 Get on in that kitchen and mix up this recipe, substituting Splenda for the sugar. Its how I make mine and my kids have never known! 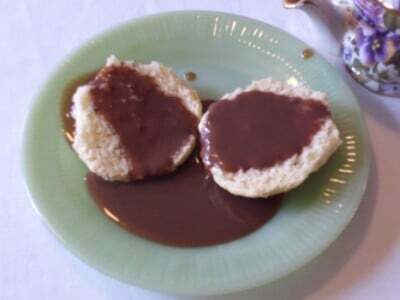 In fact, this chocolate gravy pictured was made with Splenda! Ahhh, the dish that started Southern Plate! I make my banana pudding with all Splenda instead of sugar. I use regular Nilla Wafers because they don’t have much sugar in them anyway, but you can buy sugar free wafers if you like! Yup…I even substituted Splenda for the sugar in this rice pudding, too…Mama Reed would be proud! 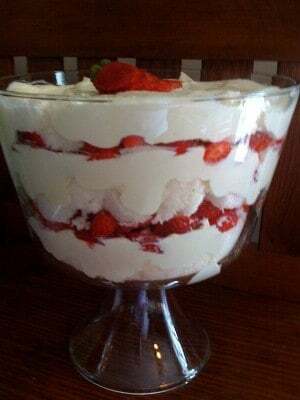 Now for this gorgeous little thing, we use sugar free jello and light or fat free whipped topping, fat free angel food cake, and fresh strawberries to create a light and delicious dessert! These hit the spot when you want something quick and sweet. 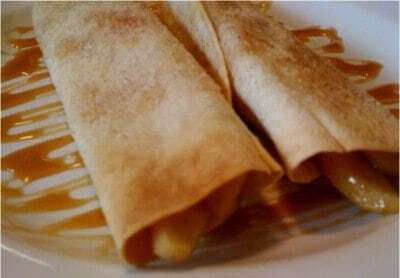 Warm apple pie in a crispy tortilla shell, I use Splenda in place of sugar throughout this recipe and omit the caramel sauce at the end. My husband can never tell if I’ve made them with Splenda or sugar! Craving a tropical drink? 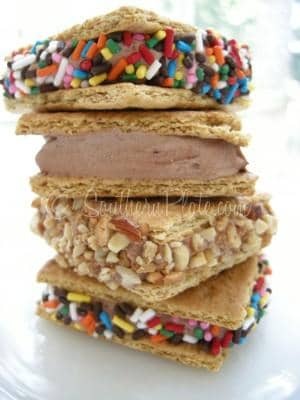 Something icy and cool, I often make these for breakfast, using Splenda in place of the sugar. Y’all know I can’t even remember the last time I drank sweet tea with sugar! It’s been almost ten years! I substitute Splenda for the sugar. If you’re a bread pudding lover like me, you’ll love this recipe which uses leftover hamburger or hot dog buns! Splenda for the sugar, and you can eat it guilt free! I often make this recipe and use Splenda in place of the sugar. 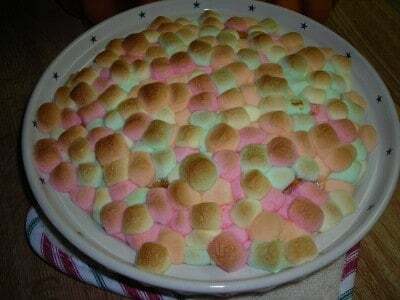 You can omit the marshmallows and still have a wonderfully delicious dessert or side dish! Thank you all so much for hanging in there with me as I hit the home stretch on the book! If you have any immediate questions about Southern Plate recipes, please leave them in the comments here or on the Southern Plate Family Facebook page. Our Southern Plate family is as helpful as they can be! 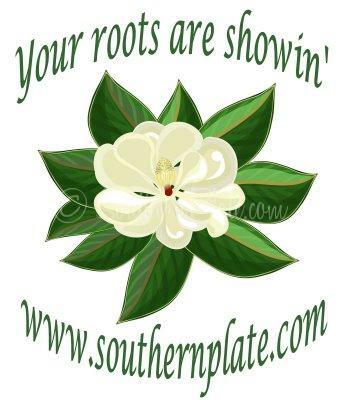 If you’re new to Southern Plate, WELCOME!!! Sit a spell, stay a while, and get to know all the wonderful folks here on my virtual front porch (you are welcome to reply to comments and chat with other readers!). I’m a little out of pocket as I finish up my book for Harper Collins but I’ll be around to fill your tea glasses directly! Submitted by Donna in SC. Submit your quote here! Dead fleas wouldn’t fall off’n him. Bless his heart. 10 of YOUR Favorite Southern Plate Posts! Those all look scrumpdillyicious! It is a good time of year to be thinking low sugar as I am still struggling with pounds which I put on with my holiday indulgences. Love any kind of tips and recipes as weight is a constant battle for me so anyone who has some good ones-please share. Thank you so much, Elaine! I recently lost a good bit of weight and did up a notecard of what I did because folks were asking. I’ll try to send it to you soon as the dust settles! I am thinking much of your weight loss is from sheer activity. You always sound busier than a one armed paper hanger to me! Christy, sent the info on weight loss to me too! please send a copy to me too!!!!! thanks! You are looking great. Elaine, low carb has really worked for me. I’ve lost belly fat mostly which is what I needed to do. I don’t eat rice, corn, white flour, potatoes, bread and hardly any sugar. Typical breakfast is eggs and sausage or bacon. Snack might be a piece of fruit, low fat string cheese, sugar free yogurt. Lunch is protein and vegetable and same for dinner. Last night I had a steak and brussel sprouts and low carb ice cream for dessert. Nearly every day I eat Jello Cook and Serve sugar free chocolate pudding made with skim milk. That gives me the chocolate fix. 🙂 Good luck to you! I don’t know why people don’t understand how adaptable southern cooking is! Some people automatically get turned off by the higher fat and sugar content of recipes but just some adjustments like adding sugar substitutes for sugar and/or using similar lower fat products and most recipes can be adapted to suit individual tastes and needs. Of course the results are not perfectly identical to the higher sugar and higher fat originals, but the recipes are still wonderfully tasty and decidedly southern! BTW I so enjoyed meeting you and your family at the Athens State event. What a pleasure and inspiration you are Christy! I can hardly wait for your book to come out, I’ve got a list of people to send copies to. They are all excited about it too, cause I’ve really been talking it up to them. Remind me, how soon can we get the book? Keep those recipes coming Christy! My family and I really appreciate them and you! These all sound so yummy! I have a hard time with “fake” sugars, because they give me the shakes, but I’ve never really tried splenda. I should..Lord knows I could use a little help in the weight department. Olivia decided to tell me that my belly was as big as Santa’s a few weeks ago. If that’s not enough to get me back to taking better care of myself, I don’t know what is! Hey Christy, thanks so much for the recipes! I’ve been looking for low and no sugar recipes as my doctor recently told me that my blood sugar was an area of concern. I’ve lost 16 pounds in 21 days and am just thrilled! Congrats on your recent weight loss too girl! 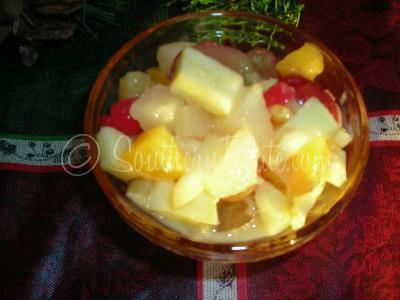 I tried the fruit salad with Splenda and took it to my in-law’s last year for Christmas. I really liked it which is a good thing because I wound up taking most of it home! I’ve discovered that the most popular dessert items at their get-togethers are portable and involve chocolate, whipped topping, and nothing low cal! That’s why at another family gathering I took your chocolate sundae cake in cupcake form. They were totally devoured! And I’ll put in another plug for lemon chess pie made with Splenda. Yummy! My husband’s favorite dessert now! I can make it without looking at the recipe! Donna, filled with the banana pudding sounds good! Having a son whose insulin output is never consistent it’s always a good thing to have sugar free items lying around the house just in case it’s one of his off days. I’ve done some similar things in the past but this gives me a whole new repertoir to add to the kitchen!! Thanks so much for reminding us of the many good “old” recipes available here on Southern Plate! I usually just leave sweets alone period but the Iced Tea is a lifesaver. Like Jamie up above, It’s the potatoes and pasta I miss. I made the regular doughnuts with the biscuits but not the creme pies. I know dad would love them but I also know my willpower stinks to high heaven lol. Can I say THANK YOU SOOOOO MUCH for this posting. My Husband is now being diagnosted as a diabetic from High Cholesterol. I am trying to read as much as I can because trying to figure out how to make some special food that makes him feel like he is not missing out has been hard. Sweet tea or I should say, sugar water with a little tea has been the hardest. He would drink a gallon almost by himself each evening. So he is trying to figure out which sugar subsitute he likes everyone has their own peference. Christy, I also, would love to have a copy of your, Weight Loss Secrets. I tried to go to the Baby Boston Cream Pies, but got the Poke Cake instead. 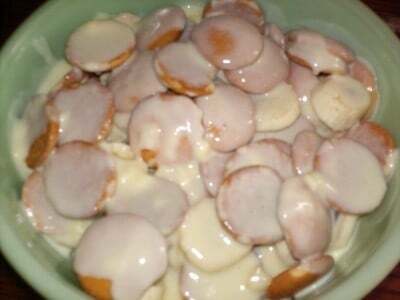 On your donuts (pies) did you use frozen bread dough, for the filling I figured you used a sugar free pudding. I really would love to see the recipe, because all your recipes are so-o-o good. Hi Wendy..I’m sure this cliche will be fixed soon :)! In the meantime …go to the top of this page..you will see a white rectangle on the right side in the black strip under the S.P. headline. 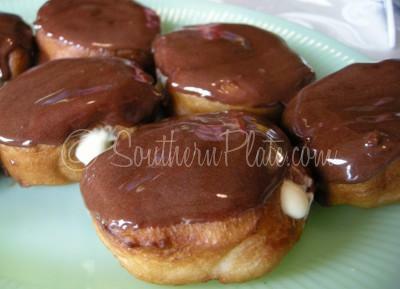 Type in Baby Boston Creme Pies then hit enter. That will bring you to them or you can look in the index on the left side of the black strip! Hope this helps!! Hi, Tina… That did the trick. I’m so glag to find out that the pies are biscuits & not frozen bread dough. I’m still learning all the little tricks to a computer, my kids & grandkids get so tired of me asking them questions, all I hear is “Oh, Nana not again!”(smile) Now I know one more thing. Thanks so much. JUST LOVE YOUR VIDEO AND THAT KATY IS ADORABLE. LOVE YOUR LOW SUGAR DESSERTS WILL GIVE THEM A WHIRL. ON THE NOTE I BOUGHT A FEW BOXES OF PUMPKIN SPICE PUDDING THAT WAS ON SALE FOR 15 CENTS A BOX AND I WAS WONDERING IF YOU HAD ANY RECIPES THAT I COULD USE THIS PUDDING IN? ANY RECIPES WOULD BE GREATLY APPRECIATED. AT 15 CENTS A BOX I JUST COULDN’T RESIST. How about a trifle? layer alternately ginger snaps -either whole or crushed. A layer of your prepared pumpkin pie spice pudding followed by a layer of cool whip. Repeat layers and chill. By the way, I have never seen pumpkin pudding mix and it sounds wonderful. What brand is is? It must have only been distributed regionally. Maybe even a test market? If it was 15 cents a box maybe it did not sell well. 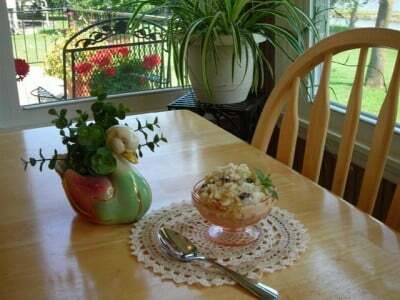 Christy, Glassware for (1)Buttermilk Congealed Salad and (2)StrawberryAde above are like those my Mama used. I have one of my Mama’s sherbet dishes, but none of the Ade glasses. I love it when I spy an older piece from years ago. And I recognize many of your dinnerware. Just wanted to let you know I made the Baby Boston Creme Pies and they are fantastic. I will be making these often for sure. Thanks for all you do for all of us, you are greatly loved and appreciated my my family and myself. A terrific, healthy sweetener substitute – Agave nectar. It’s like honey, without an aftertaste, and safe for diabetics. It doesn’t spike blood sugar, so low on the glycemic index. It works particularly well for sauces, mixed fruit, and yes, you can bake with it. I usually just cut back on the sugar and add some agave in place of it so you still get some of the crunch and crust that sugar brings to baked goods. 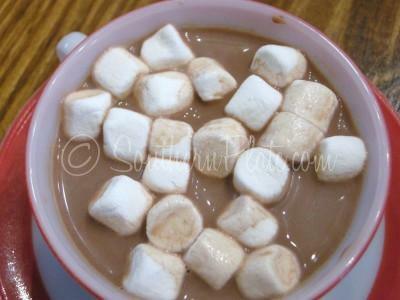 It’s a great sweetener to hot chocolate made with soy milk and dark cocoa. Agave nectar is made from a plant, so there are trace elements and antioxidants. 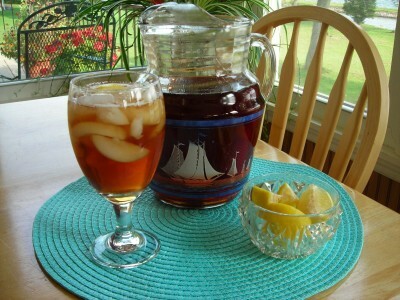 Also, unlike honey, it dissolves in cold liquids, so you can use it to sweeten iced tea or homemade lemonade. 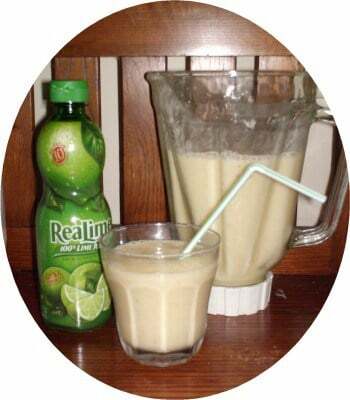 At first you could only find this in health food stores for about $6 a bottle. But now it is showing up in grocery stores for $4 a bottle. I often buy it online by the case. Recently I found a 16 oz jug in my local discount grocers for $4.00. Can you tell me were to look for the Agave Necture in the store? Is it by the sugar or Honey section? For me, I found Sweet ‘n’ Low to be the one product that had the least fake taste to it. Thanks for the recipes!! They look absolutely great and I’m anxious to try a few! Hope life gets back to “normal” for you soon! We’re thinking about you . . . even throwing in some extra prayers for you! Thanks so much for the low sugar/no sugar recipes. I will print out the recipes and try them for my hubby. I’m sure he will appreciate them. 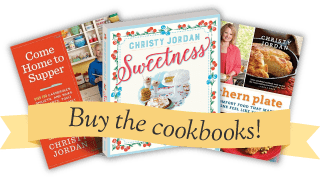 I have to be careful not to get too much sugar in me….but I love to fix desserts….I am so excited to try a few of these yummy recipes, especially the Banana pudding!!! Thanks you are the best!!! Thank you so much Michelle!! I hope you enjoy some of the recipes. Thank you for the low/no sugar recipes. Being diabetic I am always looking for new ideas. Interested in your weight loss post or info. Thanks for all you do I really appreciate all of the positive posts and the scripture copying. You are welcome!! Search the site for low-carb and you will find more recipes that are diabetic friendly as well as information on what I have done.